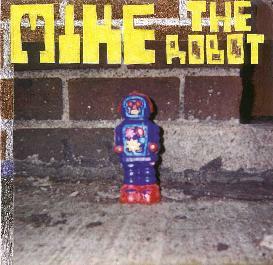 NOTE: This review has been updated for the January 2001 issue to reflect the release of Mike The Robot on CDR. The same folks who produced such diverse recordings as the ultra cool space freakout JFK Jr Royal Airforce and the ultra insane Geeky Dorks continue to crank out a variety of rockin' fun records. Here's the skinny on two new 7" discs one older release. 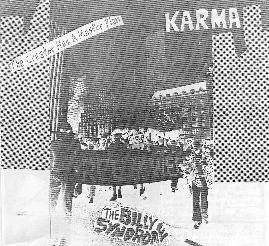 The older disc features a couple tunes from The Billy Syndrome. "Karma" is a jamming psych tune with continuous soloing guitar and an Eastern atmospheric flavor. But regardless of the style the lyrics alone would make this a psych tune whether it liked it or not. A sax soon joins the fray and trips along with the band. About halfway through the song all hell breaks loose and the band goes into a completely chaotic freeform blitz. But they soon comb their hair, straighten their ties, and return to the original theme for the finale. I'm not sure how "Funky Monkey" originally sounded but we'll never know as it's played backwards. In fact, I've a suspicion that this is "Karma" in reverse. Maybe not. Moving to the present year, The latest from Billy Syndrome features a quartet of cool songs, all pretty different from one another. "Home Sweet Home" is a swingin' Rockabilly tune led by a cool Hawaiian guitar and chirping birds. Sound weird? It is. I love it. "Eternal Prison" is a raw, but cool pop-psych tune. Dig that harmonica. "Dog And Cats" is a fun in the studio' freakout tune. I think the wild vocals are the star here. And speaking of vocals, "Broken Bones" is a good ol rock n roll tune features some wildly efx'd vox. Mike The Robot offers up a couple tunes of steely electronica. "Logic" is an electronic tune with a machine-like feel and decidedly robotic vocals. "Must destroy! Must destroy! Imperfection! Imperfection!" "Louie Louie 2000" is indeed the classic 60's rocker. I can't quite make out the lyrics but they've been changed so that they can be sung by a robot. This too is an electronic tune but a real guitar solo makes its way in. A good party tune.